Nate is a 2009 graduate of Texas A&M University where he earned a B.S. in Political Science. 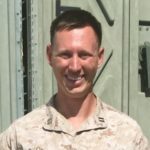 After commissioning as a Marine Officer, he served on active duty for seven years as an Armor Officer, Fire Support Team Leader, and Project Manager. He has been privileged to lead military and civilian teams in a variety of challenging missions around the world. His most recent assignment was in Washington D.C. where he spent three years leading teams addressing a variety of strategic challenges. Nate is member of the Harvard Business School Class of 2018 and looks forward to helping other veterans in their transition.